13 p. : 27 cm. (Amendment) Order 1953, for England and WJalos. Commissioners, to regulate the importation of plants and plant products. the Colorado potato beetle into those countries. sented on pages 10 to 13. (See par. 12, pd.Sei.. 10had. page 7) and Form A (Colorado beetle certification). or grafts during the period October 16 to I.arch 31 (p. 7). Minister of Agriculture for Northern Ireland. certificate shall be affixed to each package. 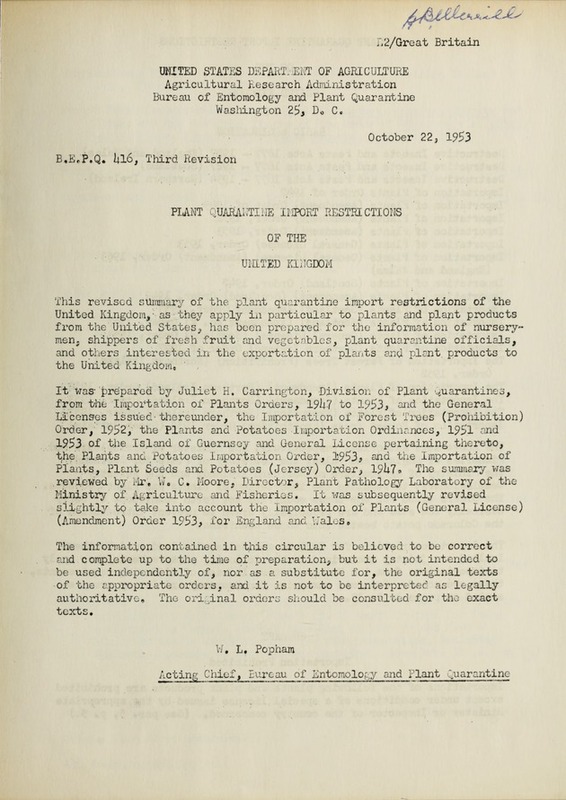 official duly authorized by the United States Department of Agriculture. (See paragraph 8, p. 8). All living plants and parts thereof (except seeds) for planting. have been found to be of the following species or kind: . license issued by the appropriate L inister or by an Inspector. the appropriate Order and Department. any of the articles prohibited in paragraphs 7, 9, 'and 12 pp. 8 and 1C. S,/ Not included in General License of Northern Ireland. Rooted dahlia cuttings, grown under glass. / See Footnote, p. 6.
the i Ainister of AgricuLture for Northern Ireland or by an Inspector. ditions of a license issued by the appropriate minister or Inspector. the minister or an Inspector. "U. S. Fancy" "Extra Fancy"
"U. S. No, 1" "Fancy"
(Signed) . . . .
(Official Status). . . . . .. .
(Date) . o . . . . . . Number and Nature of Packages .. g. . .
DistinguishingMarks. , . . ... .. .' . :Picea, Pinus, Pseudotsuga, Sequoia, Thuja, and Tsuga. or Tsuga . (Hemlock) of. the Order Pinaceae. revoke or vary such permission. vegetables,' including tomatoes but not including potatoes. (d) "Potato" includes potato haulms, leaves, and stalks. such form as the Committee may from time to time prescribe. certificate shall be attached to each package of the consignment. form (same as for Great Britain-see pp. 4-5). cut flowers (no certification required). chicory): (Same certification as for Great Britain, p. 5). (Same certification as for Great Britain, p. 5). (a) "The Committee" means the Cormittee of Agriculture. country (same as for Great Britain, par. 10, pp, 8-9). (b) One copy to the importer. St. peter Jersey, C. I. in respect of importations by air. below was grown in the. . . ? district of . . . .
and is believed by him to be free from Colorado Beetle. (Signed)' . . . . . . . .
(Official Status). . . * . (Date) e . . . . . . . . .
Distinguishing marks. . . . . . . . Exported by ,. . ., . . . 9 . .
Name of vessel on e . . . . . . o . . . Port of landing in England or Wales . . .